Symmetry is now broken unless we turn and head higher soon. The DOW is down 260, and the SPX is down 2.5% or 22 points. 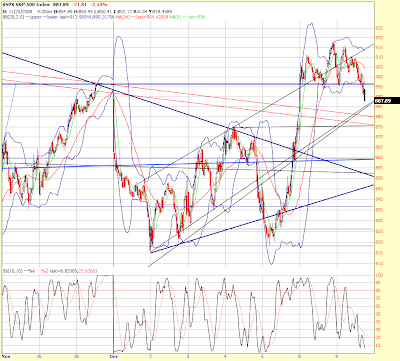 I’m attaching a 10 minute chart that shows now potential areas of support. The top of the prior wave’s high was at 875 and that area coincides with a sloppy little H&S pattern that was a top formed over the past two days. There is also support at 885, but it may not be strong enough to hold. The VIX is coming back up, the TNX is going back down too, confirming the move.